If you want a Mercedes-Benz, with its image of restrained style, disciplined authority and sporting understatement, then the car you're probably thinking about is an E-class. One of the later four-headlight second generation versions (introduced in 1995) makes a superb buy and there are plenty to choose from on the used market. The new-shape E-class of '95 with its distinctive four circular headlights began with saloons only in five forms; E200, E230 and E320 petrol models, plus two diesels - a four-cylinder E250 and a six-cylinder E300. Most of these could be ordered in three specifications; Classic, Elegance and Avantgarde. The previous shape estate line-up was still sold until well into 1996 when it was replaced in Autumn by a new-shape second generation version. The Coupe also soldiered on into 1996 (a few '97s may be about) and the Cabriolet made it to 1997. The coupe was ultimately replaced by the smaller C-class-based CLK in 1997, with a drop-top version following in 1998. 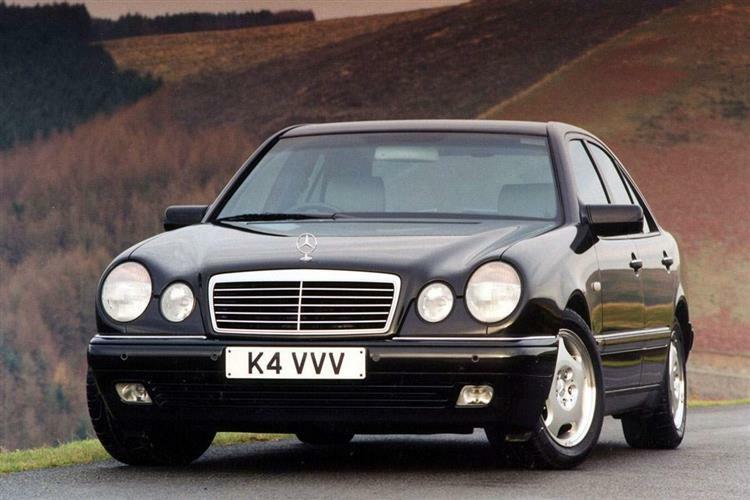 Mercedes dabbled with the E Class twice in 1997. In March, it introduced new V6 engines but, confusingly, the E280 and E320 kept the same names as their straight-six predecessors and the styling was left untouched. At the same time, a new coded, plastic ignition 'key' and locking system was introduced, as well as the company's 'Brake Assist' automatic emergency braking system. Late in 1997, more new engines appeared. This time, the old 2.3-litre four-cylinder models were replaced by the E240 (a new V6) while a V8 appeared for the first time in a right-hand drive E Class - the 4.3-litre E430. A V8 was also used in the AMG-engineered E55 AMG performance flagship, launched in the Spring of 1998. The old 300 diesel was replaced by a new turbodiesel, too. In early 1999, a high-tech 'common rail' four-cylinder turbo diesel arrived in the saloon-only E220CDI, replacing the older 2.5-litre diesel. Mercedes announced a 'mid-life' facelift for the popular E-class in mid-1999, with over 1800 changes. A subtly restyled nose and new door mirrors incorporating S-class side indicator repeaters were the main visual changes. A new 3.2-litre 'common rail' engine for the 320CDI model replaced the previous E300 turbo diesel, the E200 petrol and E220CDI diesel could be ordered with 6-speed manual gearboxes and a new five-speed automatic transmission with one-touch manual override was available. There were also many detail interior changes and equipment upgrades, including window airbags, some of which were first introduced with the current S-class. 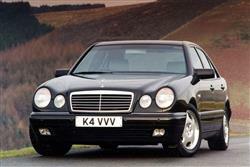 In Summer 2000, the E200 got the supercharged Kompressor engine, while the E240 got a 2.6-litre six cylinder unit. 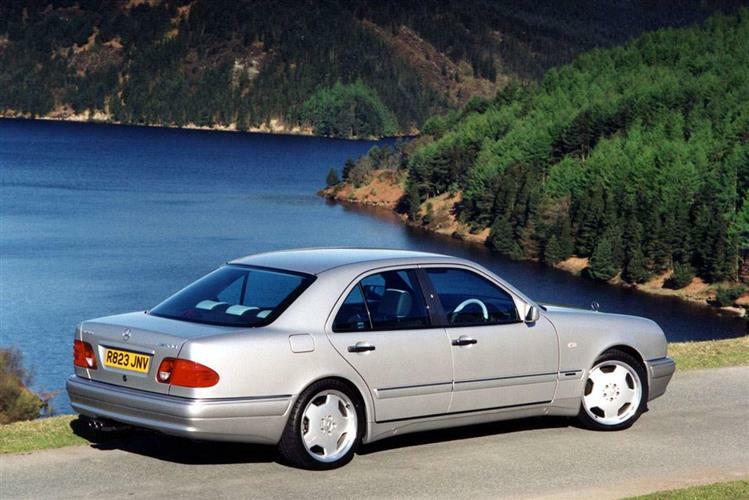 Spring 2002 saw the introduction of an all-new E-Class series. 'The Best or Nothing'. It was the personal motto of Gottlieb Daimler and the criterion he applied in creating the automobile. A century later, it remains the guiding spirit of the company he co-founded. Most Mercedes-Benz customers feel the same. Few would consider a Vauxhall or a Ford, a Rover or a Saab as an alternative, however luxurious. None of those cars could give them the feeling of driving a universal automotive benchmark, a car which sets the standards by which others must be judged. There's a great deal of mythology in that of course. In many ways, the Stuttgart company can no longer claim to be in a class of its own, with great strides by rival manufacturers, notably neighbours BMW, challenging the premium prices still being asked by the three-pointed star. Even so, the ownership of a Mercedes-Benz still remains the mark of instant status. Somehow, just seating yourself behind the wheel is enough to send a little rush of pride seeping through the veins. You've made it. Trade pundits recommend automatic transmission, air conditioning and leather upholstery and to avoid dull non-metallic colours for easy selling on. Buying from a franchised dealership is undeniably expensive, but the selection will be good an this route should take the worry out of purchasing an E-class. Going this route also entitles you to Mercedes' helpful PCP finance scheme and an impressive back-up package of after-sales benefits. If you're buying alone, look out for badly treated cars which have been disguised. Telltale signs are sagging seats and shiny steering wheel rims. (approx based on an E200 2.0 estate '95') A clutch assembly will be around £155. A starter motor will be about £195 and a radiator around £175. An alternator is around £300, a full exhaust about £880 (including catalyst). Brake pads front and rear are about £60 for the front and £40 for the rear. A replacement headlamp is close to £275. An E-class isn't cheap, and its price isn't one that most owners would attempt to justify by quoting from the standard equipment list. Having said that, the specification on most second generation cars does run to anti-lock brakes, power for the steering, sunroof, windows and mirrors, a driver's airbag, central locking and lumbar support for the seats. Mercedes-Benz has greatly increased standard equipment across the range in recent years and newer examples may also feature air conditioning and more luxurious upholstery and trim. Much the same could be said in terms of performance. Again Mercedes has made great strides and the newer engines, particularly the small V6 and the 220 and 320CDI diesels, deliver greatly improved performance and economy compared with their predecessors. Handling is precise - the car turns into corners with a crisp fluidity - and is aided by excellently weighted power steering that offers just the right amount of assistance. Less welcome from the point of view of the sporting driver is the steering wheel which, although smaller in these cars than in earlier ones, is still massive by most people's standards. Once you get used to that, you learn to respect the impressive reserves of grip on offer. The powerful, progressive brakes add to the all-round feeling of safety which the car imbues to its owner. Less familiar will be the unusual fly off parking brake, applied by a pedal on the left of in the driver's footwell. You release it with a facia-mounted handle. The interior itself looks less austere than perhaps you might expect; Mercedes brightened things up for this generation by the addition of shiny polished wood or 'carbon fibre' inserts, although the atmosphere remained very Germanic. You soon learn to live with the firm seats, which prove to be deceptively comfortable over long journeys, but less impressive on short ones. E-class estates offer a usefully sized loading area that's reached via a low loading sill. They can't rival the spaciousness of Volvo's estate cars, but look very classy and should prove ample for the needs of most owners. If you can afford the asking price, then an E-class becomes a surprisingly affordable car to own. That's down to design efficiency and tiny depreciation. Your accountant and neighbours will approve.